At K [design] we like to think ahead. And in doing so we naturally always put the interests of our customers first. We are particularly proud of this and we are now delighted to be able to present this new concept to you as a first. K [design] is the first brand in the clothing industry in Europe to introduce a unique and revolutionary concept: ODOR-FREE CLOTHING. We use our unique Silverplus technology to apply a protective coating to synthetic fabrics. The results are spectacular ... Because of Silverplus, a dress or blouse can no longer smell of perspiration. Day in, day out, evening after evening and even after a night out, the clothes stay fresh. No more bad odors, no uncomfortable feeling. K [design] customers can deliberately wear their garments one extra time with total confidence. And Silverplus has more advantages than just wearing the clothes themselves. Because the environment benefits, too: less laundry means savings in water, energy and time. K [design] has always stood for Choice, Quality and Customer focus. Which is something we are happy to underline with this uniquely revolutionary and proven application. HOW DOES THE K [DESIGN] SILVERPLUS TECHNOLOGY WORK ? Body odor is caused by bacteria that penetrate the fabric and spread. 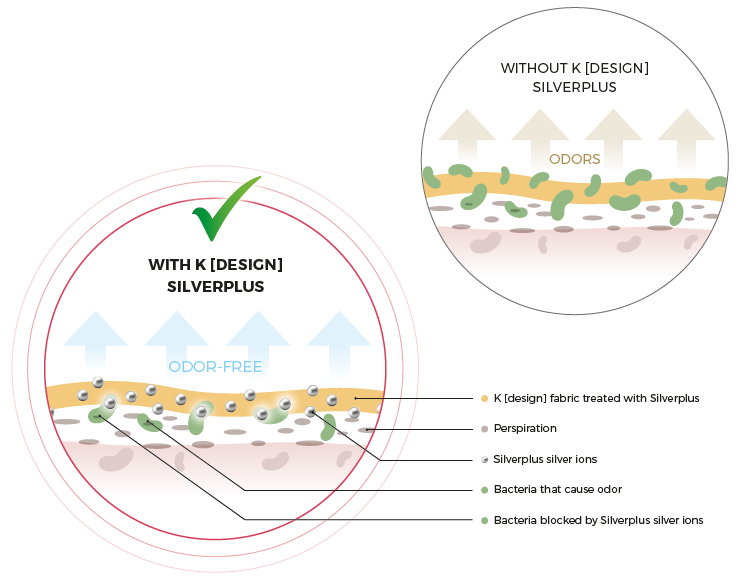 The Silverplus coating, based on silver ions, prevents the growth and spread of these bacteria. ... and ensure that there is no unpleasant body odor to worry about. WHAT ARE THE BENEFITS OF THE K [DESIGN] SILVERPLUS TECHNOLOGY ? Clothes stay fresher longer – and so need washing less frequently. And that has consequences both for the environment and for the clothes themselves.